My 8th grade teacher, Mr. Gerald Ziegler, was one of my all time favorite teachers. He understood the quirky bird I was at 13 & 14. He also taught us to play craps. That’s A Possibility! : A Book About What Might Happen by Bruce Goldstone is an excellent place to begin. 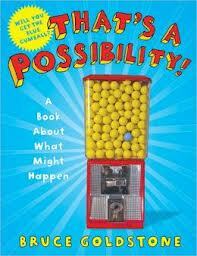 The book begins slowly talking about possibility and impossibility. It is well illustrated and give lots of examples of what each thing is and isn’t. With each turn of the page, Goldstone develops more complex ideas, again, well illustrated with kid friendly photographs that often use the kinds of realia a home or classroom will be likely to contain. In explaining concepts, readers are given specific tasks that they can try. There is also a page devoted to teaching kids how to make a spinner. The end gives a little more detail to help out adult readers, too. I’m sort of thinking that kids could create their own example for a concept and then write their own page in a class book about probability. 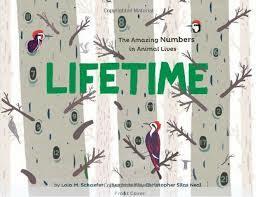 This is a great book for home, school or library.